The hotel, apartment and office tower complex was designed by a French architecture designer. High rise buildings constructed with advanced technology are very impressive. 358 guest rooms and suites are equipped with all modern facilities. The brightly decorated room provide a quiet and elegant atmosphere.Famous Cantonese and Chaozhou cuisine are served in Chinese restaurant, western food and lobby bar is also available 24 hours a day.As a newly opened luxury hotel in Beijing central area, kuntai royal is close to embassies community, worker's stadium and renowned historical site of Dongyue temple. 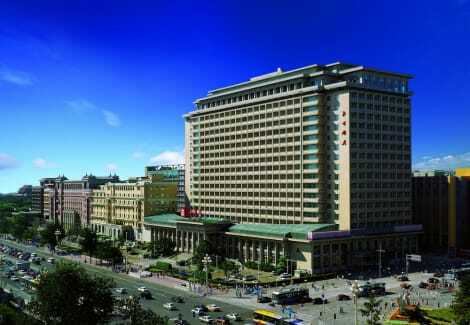 It's only one block to Chaoyangmen subway station and 30 minutes drive to the airport. Make yourself at home in one of the 460 air-conditioned rooms featuring minibars and LCD televisions. Complimentary wired and wireless Internet access keeps you connected, and satellite programming provides entertainment. Private bathrooms with shower/tub combinations feature deep soaking bathtubs and designer toiletries. Conveniences include phones, as well as laptop-compatible safes and desks. Don't miss out on recreational opportunities including an indoor pool and a fitness center. Additional features at this hotel include complimentary wireless Internet access, concierge services, and a ballroom. Make yourself at home in one of the 311 air-conditioned rooms featuring refrigerators and LCD televisions. Satellite programming and DVD players are provided for your entertainment, with wired and wireless Internet access available for a surcharge. Partially open bathrooms with separate bathtubs and showers feature deep soaking bathtubs and rainfall showerheads. Conveniences include phones, as well as safes and desks.